I’ve experimented making my own biscuits for cheese recently. You can make numerous biscuits cheaply and easily. They store well in an air-tight container or you can freeze them. Oats do deteriorate, so buy some fresh ones if you’re not making porridge regularly. I favour Harraways’ or Moore Wilson’s wholegrain New Zealand rolled oats. 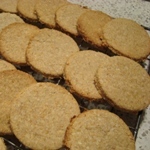 These oatcakes are a relatively sweet biscuit for cheese, almost a digestive. Pre heat the oven to 180 degrees C. Put the oats, flour, salt and sugar into a food processor. Pulse until roughly combined. Warm together the butter, syrup and milk until the butter just melts. Add to the food processor while still warm and process until it forms a dough. Roll out between two sheets of baking paper to about 3mm thick. Cut out 5cm rounds and bake for 12 minutes until golden on a baking tray. Cool on a wire rack.